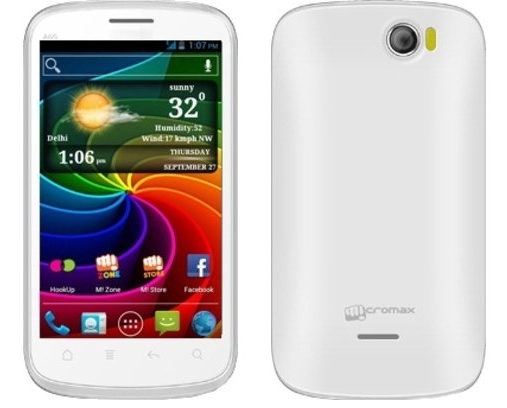 Indian mobile manufacturer Micromax launched new 4.3- Inch Android smartphone in India, called as Smarty A65. 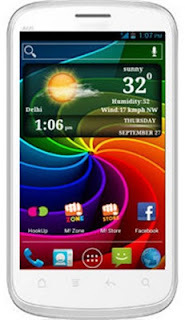 It is a Dual-SIM supported and big screen smartphone in an affordable price tag. The device sports 4.3-Inch WVGA TFT capacitive touch screen with 262 k colors and 800 x 480 pixel screen resolution. The smartphone runs on Google's Android v2.3.5 (Gingerbread) operating system and powered by 1.0 GHz ARM cortex -A5 processor from Spreadtrum. The smart phone built-in with 2 GB RAM for better performance, 190 MB internal storage and 4 GB ROM add for storage needs, The device support 32 GB external storage via MicroSD card slot. The smartphone packed with 2.0 Megapixel rear facing camera with digital zoom and LED flash light in addition to a 0.3 Megapixel front-facing camera. It has powered by a 1350 mAh Li-Ion rechargeable battery, which offers up to 205-hours stand-by time and up to 5-hours talk time on 2G network. The device offers connectivity through GPRS, EDGE, Wi-Fi, Bluetooth v2.1 and Micro USB v2.0. The device pre-loaded with Hook Up, M!Zone Plus, Mlive, Facebook, Cricket Fever, MiBuddy, Chat on the go, non-stop through Whatsapp, Facebook App and Air Control, The Dark Man Games.